BCB Promotions return to Northampton in March. 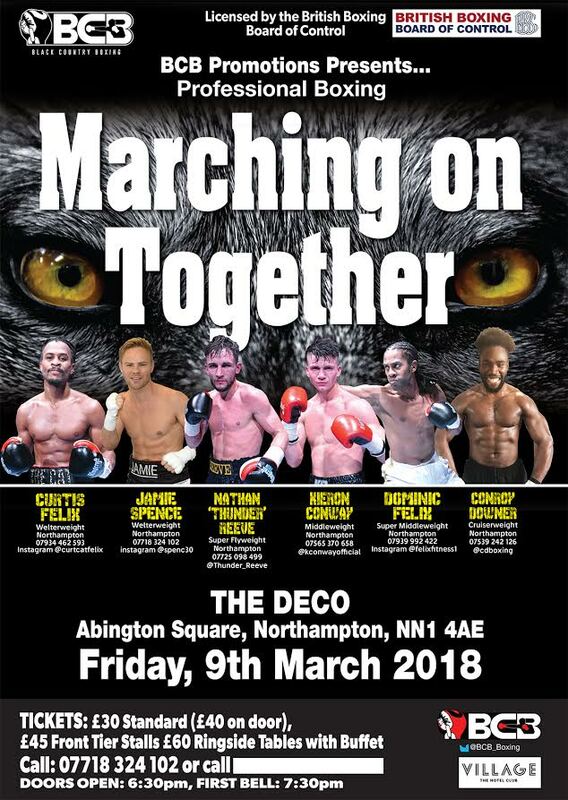 The Midlands-based boxing promotion company are hosting a six fight card – ‘Marching On Together’ – at The Deco Theatre on Friday, 9th March 2018. BCB return to Northampton after two successful shows in 2017, featuring a host of local talent. The Felix Brothers – Dominic and Curtis – are once again in action alongside fellow Northampton boxer, welterweight Jamie Spence. Northampton’s Nathan Reeve who made a winning ring return last year after a four-year sabbatical is also in action. Northamptonshire MTK managed duo – middleweight Kieron Conway and cruiserweight Conroy Downer complete the card alongside undefeated Swadlincote super lightweight, Connor Parker. Tickets are £30 standard unreserved seating (£40 on the door), £45 Front Tier Stalls and £50 Ringside Tables with Buffet. They are available by calling 07939 992 422.